Bhavnagar Municipal Corporation (BMC) is a local government body in the state of Gujarat that is committed to provide basic infrastructure facilities to the people of the city. The BMC comprehensively manages the city using private sector participation and by continually introducing innovative mechanisms in management to serve citizens efficiently. The body also governs the rich and diverse multicultural affairs in the city; a key component of which is its plush 1000 + capacity auditorium that is used for symposiums, musicals and theatrical presentations. 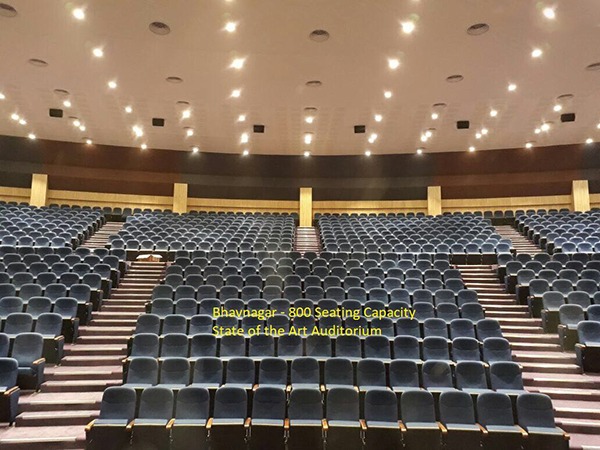 This auditorium boasts of cutting-edge sound system comprising RoomMatch loudspeakers and PowerMatch amplifiers from Bose Professional Systems, designed by chief consultant Shri Vijay Purandare based out of Pune. The comprehensive sound system installed at the BMC auditorium is configured in a dual-hang array at the FOH with each side consisting a unit each of the RM 7010, RM9010, RM9020, RM12040 loudspeakers with a pair of RMS215 subwoofers, all from the RoomMatch range of products. The FOH setup is complemented by fills and surround speakers from the RoomMatch Utility range of products, mainly the RMU108 and RMU206, and the Freespace range of speakers, mainly Freespace 203 and the DS 16S loudspeakers which are used in certain demarked zones of the auditorium space. Additional units of the LT MB12 modular subwoofers provide for reinforced low frequency delivery, while multiple units of the Panaray 620 M provide for on-stage reinforcement when needed. The FOH, on-stage sound and part of the fills/surrounds are powered by the PM8500N PowerMatch amplifiers while loudspeakers in dedicated zones are powered through the Freespace IZA zone amplifiers. The house system in total is controlled by Bose ControlSpace ESP-00 engineered sound processors and ControlSpace SP24 sound processors. The consultant Mr. Purandare were ably supported by the System integrator Effectron, Hi-Tech Audio and Vishal Kotian – the official representative of Bose Professional in the region; as the team conducted a thorough analysis of the space using the Bose Modeler sound system software, where they drew all the seating areas within the auditorium and predicted the sound coverage. The simulation helped the management realize that the design would thoroughly cover every nook and corner of the seating areas, and also revealed the exact positioning of the FOH, and the other speakers used as fills and surrounds. “Using Modeler let us get predict the speaker system’s overall performance in terms of tonality and coverage as well. The system covers the space down to its last inch, delivers great intelligibility, and amazing music support. That’s the hallmark of a great system. And we are extremely happy to know of the management’s approval and satisfaction with the performance of the system” exclaimed Manik Gupta of Hi-Tech Audio.